Formulated with Aloe Vera & botanical extracts, high enriched moist & mild texture provides hydration & nutrition to the dry skin after wash off. How to use: It can be applied to hair, face and body as often as desired. Deep green plastic colored round plastic tub contains 300g of 100% pure aloe vera gel. At first I solely use it for moisturizing my body. If you are not a fan of the sticky feeling of lotions then this can be your best buddy. It doesn't just moisturize though, it also helps in diminishing itchiness if you have ant/ insect bites. One application make my skin feel refreshed. My skin looks glowing after use but the Pax Moly Aloe Vera Gel magically dries into matte finish. Its never sticky I swear. It is easily absorbed my my skin making it also perfect for humid weather. Pax Moly Jeju Aloe Vera Gel can also treat sunburn, or if you have have prickly skin because of the heat of the sun. Its all natural and said to whiten skin in the long run, however I cannot personally attest to that. I have fair skin to start with and there is no visible changes yet in terms of whitening. Pax Moly Jeju Aloe Vera Gel 100% is said to prevent wrinkles and fine lines. I use it on my face but since I don't have wrinkles I am yet to see this effect. 4. Reduces AcneIt did helped in drying my pimples, alongside with another of my favorite Pax Moly product right now Pax Moly Aloe Vera Whitening soap. I cannot attest about the marks but other users say it lightens the mark as well. Will look into that further because usually natural products takes a while to do its magic. In terms of stretch mark it doesn't look as bad as before. Mine is not dark type of stretchmarks, its actually light and its on my legs. My skin's texture improved ever since I used Pax Moly Aloe Vera Gel. My face is very soft every time I use this and my skin's texture is so much better than before. It didn't caused me pimples also. P250 per tub, you may buy it online from authorized distributors or from our shop: Oh-some MNL or Shopee. The natural aloe vera scent! Nothing I can mention, or maybe you will want to buy it offline too, that can be a con? You may use Pax Moly Jeju Aloe Vera Gel as a toner as well. You can mix 5 parts of aloe vera gel to 2 parts of water. Or you may apply the gel using a cotton pad and use it as toner also. Nifty! Apply aloe vera gel on your feet and wear socks. Wake up to very soft feet! My whole family are using this and we are on our 3rd tub. Basically one tub lasts for a month! PAX MOLY Jeju Aloe Vera Gel 100% is a multi-purpose product which makes it bang for the buck! It can be used from head to toe and the price is reasonable. In terms of Aloe Vera Gel this might be the one. I tried other brands so I can compare really. I am not a big all natural advocate but you got to try Pax Moly Aloe Vera Gel now and see why its different. ~Up next is PAX MOLY Aloe Vera Whitening Soap Review! Does this pax moly brand have any other product besides this aloe vera gel? Haha, i wanna try this product too but i'm never hear this brand. 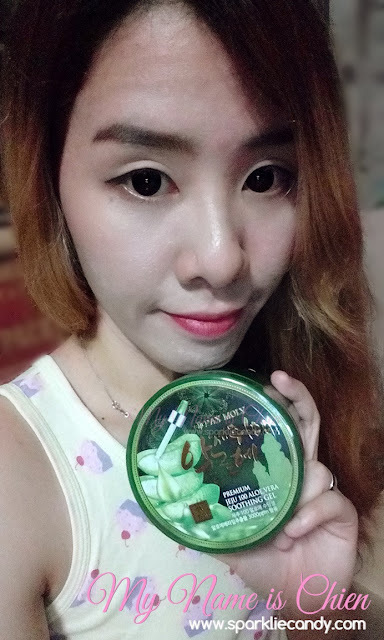 Hello, I have just tried Pax Moly 100% Aloe Vera Gel for a about a week and it the results are really nice. You should try it. It's not harmful because it's organic.